Hopefully you took advantage of our Gerber Apocalyse set post, if you didnt then Zombies probably already got you. 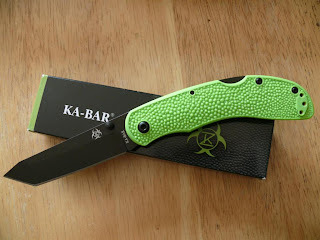 But if your one of the lucky ones that survived you better not pass up the Ka-Bar ZK(zombie killer) collection. In celebration of the mid-season finale of The Walking Dead which aired last night on AMC we wanted to give you some more zombie killing options to add to your arsenal. 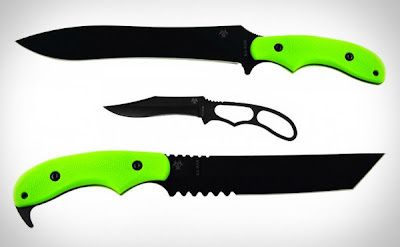 This is another set of awesome, affordable cutlery meant for killing zombies and surviving through the apocalypse. They are made by Ka-Bar, originally a producer of military knives. They have a history of great craftsmanship. This collection is very reasonably priced on Amazon so click here and get the whole set so you and five of your friends can be ready. If you own one of the knives featured here we would love to hear your reviews. You can post them in the comments section at the bottom of the page.